The main allure of almost every story is finding out what happens next. But building a television show almost entirely around that allure is a dicey proposition at best, because — aside from 24 and Lost, success stories that became primary influences for future showrunners — writers tend to run out of semi-plausible, somewhat usable plot pretty fast and are left burning the fumes of contrivance. NBC seems undaunted by this. The network has built a two-hour block of Sunday night programming around purely plot-driven shows with lavish production values and big casts: Believe, about a fugitive, possibly telekinetic girl whose fate might hold the key to humanity’s survival, and Crisis, about terrorists kidnapping a busload of rich people’s kids, including the president’s son. I’m not crazy about either of them. They’re both earnest, well-acted, and efficiently directed, but beyond the temporary pleasures of guessing what predicament the hero or heroine will get into or out of, I’m not seeing much evidence yet that either show has real personality. Believe, which was co-created by Gravity director Alfonso Cuarón, is two episodes into its run. It feels like that Bruce Willis thriller Mercury Rising, crossed with a modern Messiah story and the X-Men mythology. 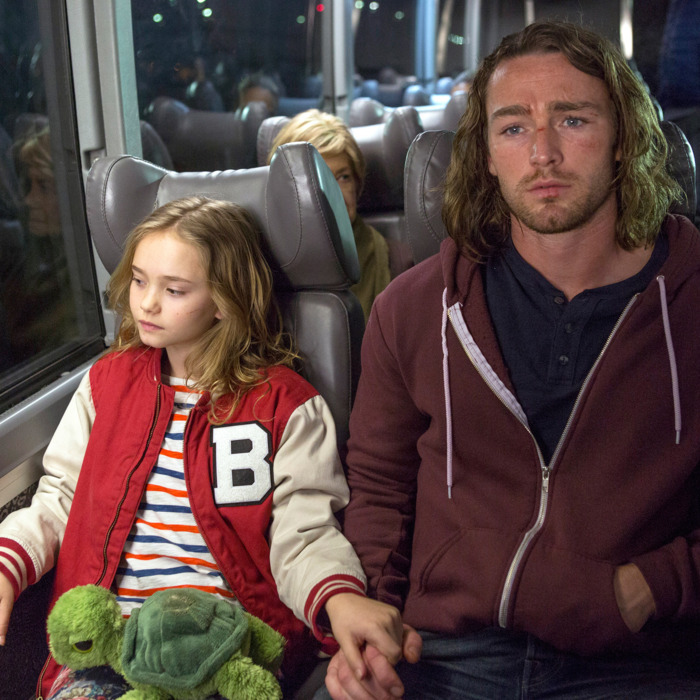 Johnny Sequoyah is Bo, the psychically gifted little girl saved from assassination in the pilot and taken on the run by a recently escaped prisoner named Tate (Jake McLaughlin). Competing forces, all not entirely trustworthy, are trying to get their hands on Bo. There’s a group headed by a man named Winter (Delroy Lindo), which is tarred as a terrorist organization but seems to have the girl’s best interests at heart. His opposite is Skouras (Kyle McLachlan), who heads what looks like a sinister training school. In last night’s episode, we saw a young man in Skouras’s care build a giant lion out of bricks, Lego-style. Bo is constantly pulling tricks like this, but usually on a smaller scale: making a police car suddenly slip into reverse during a traffic stop, for instance. Even though her rapport with Tate is agreeably cute — abrasive in a Paper Moon sort of way (a line in Sunday’s episode seemed to come right out and say that he’s her dad but doesn’t know it) — it’s not resonant enough to sustain a show. And Believe is going to have to look to other sources besides plot, especially at the rate it’s burning through it. By Sunday the government had issued an Amber Alert for Bo, which puts the girl’s face on televisions, street posters, and social media, and will make it increasingly hard to believe her and her dad surviving as anything but prisoners in the custody of one competing force or another. For all its irritations, however, I find myself strangely drawn to Believe, not so much because I want to find out what happens next, but because I’m curious to see how the writers can pad this thing out over a period of months without seeming desperate and ridiculous. Crisis is more grounded in the real world, but only slightly, and that doesn’t give it any sort of edge. Halston Sage, Stevie Lynn Jones, Joshua Erenberg, and Max Schneider are among the kids held hostage by bad guys who seized their bus en route from their super-elite prep school. Gillian Anderson is Meg Fitch, the CEO of a giant corporation and the mother of Sage’s character, Amber, a coolheaded and beautiful class president. We also learned on the pilot that Fitch is the sister of FBI agent Susie Dunn (Rachael Taylor), and that Amber is actually Susie’s daughter. There were plenty more twists where that one came from. Francis Gibson (Dermot Mulroney), the nebbishy basket-case father of scholarship student Beth Ann Gibson (Stevie Lynn Jones), volunteered as chaperone on the field trip because he’s secretly in on the kidnapping. He’s not the only parent in cahoots with the bad guys. This crime has many tentacles, it seems. But how interested are we in watching them unfurl? Next week’s twisty episode, which I won’t describe in detail here, is not much of an improvement. The problem isn’t the actors, who are mostly excellent (I could watch an hour of Gillian Anderson just staring into the camera; how about you? ), but the specific vibe of the storytelling, which, like Believe, serves up “characters” who are really the sum total of their résumés and plot functions. They have no inner lives. They have no eccentricities. They are defined mainly by their desperation or their mission. And for that reason, they all seem dispensable. The show lacks a white-hot center — a Jack Bauer (24) or Raymond “Red” Reddington (The Blacklist) who can raise the entire project to the level of delirium. Instead, it has lists of traits played by actors. “Listen I’m a fully trained Secret Service agent. I was a D.C. cop for three years before that,” says treasury agent Marcus Finley (Lance Gross), who’s wounded early in the pilot but still ends up protecting Erenberg’s character. “So which one are you, Mr. Gibson, the one out there desperate for his daughter’s love, or the one in here with the computation book?” a terrorist asks Mulroney’s character, seemingly after reading the notecards on the wall of the writers’ room. These aren’t the only two shows on TV that, on first glance, at least, seem as though they would’ve played better as miniseries with set endpoints. But they are the most prominent.